S. T. Anderson to the Secretary of the Navy Sackett's Harbor, 13th Nov., 1812, at night. Sir,—Since the enclosed letter from the Commodore was written the Growler has returned with a prize, and in her Capt. Brock, brother to the late General of that name, with the baggage of the latter. By the prize we learned that the Earl of Moira was off the False Ducks, and the Commodore has put off in a snow storm in the hope of cutting her off from Kingston. From information received from Captain Brock there is no question but Kingston is very strongly defended. He expressed surprise to find our vessels had got out of the harbor after having been in it, and says that the regiment to which he belongs is quartered there 500 strong, besides other regulars and a well appointed militia The resistance made fully justifies this report. Be assured, Sir, that in the action of which the Commodore has given you an account the national honor has been most ably supported. For more on James Brock see the excellent article by Stephen Otto "James Brock Brockton’s Name Recalls Isaac Brock’s Cousin" which can be found here. 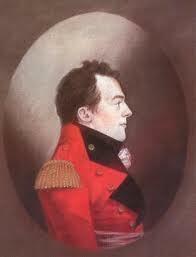 The attack on Kingston is described by Robert Henderson in his fine article "Full of Confidence” The American Attack on Kingston Harbour in 1812" which can be found here.